Propolis is a resin that because of its sticky like glue, called bee glue. bee propolis is actually generated by collecting resins from various plants, and then the resin is mixed with saliva and various enzymes that exist in a resin that bees are different from original resin. Because the source of all sorts, the colors, the composition and properties of propolis may vary. propolis can be yellow to dark brown, even transparent. The chemical composition of propolis flavonoids consists of covering nearly 50% of the composition of propolis, kafeat acid, ferulic acid, and minerals in small quantities. The use of propolis as a drug has actually been done since the 12th century. Greeks and Romans have used propolis to treat swelling. 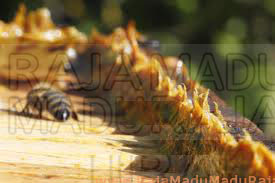 The Egyptians than using propolis as medicine, also use it as an adhesive in the manufacture of canoes. For bee propolis alone serves to protect the entire nest and the queen bee lay her eggs of pests that cause decay eggs that Bacillus larvae. This is what underlies the use of propolis as an antibiotic. Then conducted numerous studies on the effects of antibiotics propolis against various microbes. The results are starting Karimova since 1975 against Bacillus de koch and then followed other researchers showed that propolis has a bactericidal effect against Bacillus subtilis, Staphylococcus aureus, Streptococcus, Streptomyces, Streptomyces sobrinus, Saccharomyces cerevisiae, Escherichia coli, Salmonella and Shigella, Giardia lambia, nodocuc Bacteroides, Klebsiella pneumoniae, but it is also effective as a fungicide on Candida albicans, Aspergillus niger, Botrytis cinerea and Ascosphaera apis. Interestingly the results showed, propolis is more effective when tested its effect in vivo than in vitro. This is because propolis could serve as an immunostimulant, which stimulates the function of various organs and induce the immune system to be more resistant to germs. Advantages compared to other antibiotics propolis is a minor side effect. The only side effect that occurred, and it was seldom that allergic reactions when used locally. Meanwhile, when given orally no side effects occurred. Another advantage that is not cause resistance. Antibiotics such as penicillin can cause resistance because the bacteria can renew itself to be more resistant to penicillin. But the bacteria or virus can not become immune to propolis. In addition, propolis as an antibiotic has high selectivity. Propolis only kills germs that cause disease only, while useful as microbial gut flora is not disturbed by propolis. Active substances known to be antibiotic propolis is ferulic acid. This substance is effective against gram positive and negative bacteria. Ferulic acid also are agglutinating (involved in blood clotting), so it can be used to treat wounds and given in the form of ointment. Based penelititan carried S. Scheller, et al tested the anticancer efficacy of ethanol extract of propolis (EEP) in mice induced by ehrlich carcinoma cells showed that mice can survive more once given EEP. EEP anticancer effect against Ehrlich carcinoma cells is related to the content of flavonoids in propolis. Flavonoids affect the stages of cancer cell metabolism by inhibiting incorporation as thymidine, uridine, and leucin with cancer cells that may inhibit cancer cell DNA synthesis. The role of flavonoids as anticancer also confirmed by other experiments that use hydrocarbons as polycyclic aromatic penginduksi cancer. The mechanism of inhibition of polycyclic aromatic hydrocarbons associated with the inhibition of metabolic stimulation induced by polycyclic aromatic hydrocarbons and affect the activity of several cell promoter. Flavonoid is a tu sua substance found in many plants, but in propolis are in concentrated form. With the metabolic system, the bees made from plant flavonoids are more effective. So bees as if the intermediate flavonoid with humans and animals. Flavonoids are found in the EEP include betulinol, quersetin, isovanilin, galangin, isalpinin, kaempferol, rhamnetin, isohmnetin, pinocembrin, pinostrobin and pinobaksin.